In the past, I've talked about TBR expectations and why I love reading challenges. Today I want to sort of combine those topics and discuss a way to help you make progress on your TBR through personal monthly goals. I know lots of bloggers make monthly TBRs, so this kind of goes along with that and takes it one step further. I will say, though, if you're a mood reader, this strategy may not work for you! Today's post was inspired by my sister, Michele. After I started blogging and she was introduced to other bloggers, her TBR began to explode. She told me one time that in order to organize it and make it more manageable for herself, some months she sets monthly goals focused on one specific type of book or genre. Yes, there are challenges out in the blogosphere like this (Clean Our Your E-Reader and Nonfiction November immediately come to mind), but since my sister isn't a blogger and doesn't participate in things like this, she does this for herself. For readers looking to make a dent in their massive TBRs, this strategy may be helpful to you because it will help focus your reading. 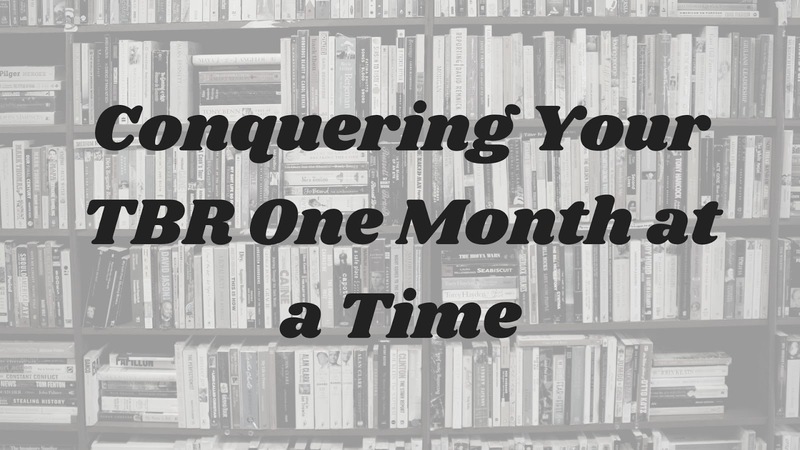 One month isn't so long that you'll get bored, but it's long enough to get a bunch of reads in. This strategy works for Michele because she has a wide variety of books on her TBR (YA, contemporary fiction, non-fiction, etc.) and it can be overwhelming at times to figure out what to read next! Having a theme month allows her to focus on one thing at a time and be thoughtful in her book selection. While she doesn't use this strategy every month, she feels like she puts a meaningful dent in her TBR when she does. What do you think of this strategy? Do you have a plan of action when it comes to your TBR? I think it's a great strategy. I'm a mood reader so I'd probably have to have a plan B in place just in case those moods to jump genres hit, but I could still see this being a great starting point for me. Thanks, Suzanne! I agree, though, if the mood strikes, you gotta go with it! I’ve seen other bloggers who do this. I’ve done Nonfiction November, but I haven’t tried any other themed reading months. Maybe I should. I might have enough YA books to get me through a month. A YA month would be fun! Now that it is tax season, I will be focused on my book hauls and only books I have in my house or on my kindle - unfortunately, no time to get to the library! This is a fantastic idea! I've seen a few other people around the blogosphere doing this, and I think it's such a fun way to pick out your next read. Sometimes the options are overwhelming lol. I love seeing what themes people are working with each month/week/etc., however they're deciding to do it. My TBR is regrettably huge and evergrowing. And not shrinking. As much as I love to read things, it's always been so difficult to actually start a new book! Aghhh. Thanks for sharing your sister's strategy! Surely this is one that can help many! Thanks, Eve! I think so, too. I definitely agree, it can be hard to pick out that next book, but using a strategy like this will really help narrow it down! I think I am doing like 10 reading challenges, and I keep using ARCs to meet the criteria. I am the worst. It's still fun, even if I am not reading my own books. Though, I am trying harder than ever. ARCs are fun, too! It's cool to be able to read something before everyone else. I think seasonal is good, too, definitely helps those mood readers! I've never done a reading challenge other than setting a Goodreads goal and that hardly counts. I am something of a mood reader and don't think I could stick to one particular type of book for a month. I don't even typically want to read the same genre two books in a row! I think it's a great strategy though for people who struggle with what to read next. I can relate, Susie, especially to being a mood reader. This is one of the reasons I can't be part of a real book club--it feels too forced, like I'm back in school! Yeah, it's definitely not a strategy that will work for everyone! I love this idea, but as a mood reader it doesn't always work for me :( I do, however, try to do some of these. I desperately need to read the books I own already! One of my goals this year is to read more from my own shelves, and I think I've come up with a good way to do that - to bring those books to read on my lunch break. I can just leave the book in my desk drawer and know I always have something to read. Honestly, I'm such a mood reader, I don't tend to do very well when I plan my reading ahead of time. I do best when I keep the goals very broad, like reading at least 24 backlist books from my TBR in a year. But for someone who enjoys setting more specific reading goals and meeting them, it could be a great strategy. Yes, I agree, it's not going to work for everyone! I have to reorganize after I get out of university. Now, I just try to grab a book every chance I get and that is not often. I still would like to do this. I think it's a great idea and great planning. Thanks, Mary! Yeah, I would definitely have more from certain genres than others, too!